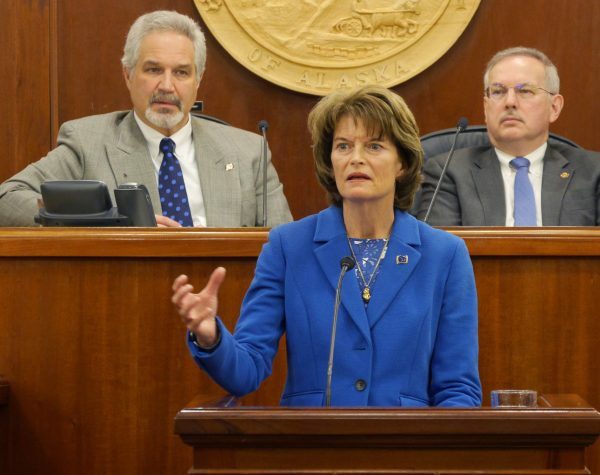 In her annual address at the state Capitol, Sen. Lisa Murkowski spoke passionately about the shooting that killed 17 at a Florida high school last week. She called on Congress to take action. No issue, she said, should be off-limits in the national discussion about how to stop mass shootings. In much of her speech, she discussed recent accomplishments in Washington, D.C., particularly new opportunities for oil development on Alaska’s federal lands and waters. Then she turned to the shooting. Murkowski said the political impasse in Congress has to end, as does the tragedy cycle. Murkowski touched on a number of areas Congress can improve, even mentioning the possibility of an app kids could use to alert adults to a classmate who seems off-kilter. One of the loudest calls from the high school students who survived the Florida shooting is to ban the AR-15 and similar semi-automatic rifles of the type that were used in Newtown, in San Bernardino, at Orlando’s Pulse nightclub, in a Texas church, in Las Vegas. At the press conference, Murkowski asserted her support for the Second Amendment and said banning a particular weapon isn’t the answer. Asked whether America has a problem with the accessibility of guns, Murkowski gave a more narrow answer. “I think the U.S. has a problem with accessibility to guns by people who are mentally ill, yes,” Murkowski said. State Rep. Adam Wool, D-Fairbanks, said later that he appreciated Murkowski’s thoughtful discussion. He said he also liked Murkowski’s focus on mental health, though Wool doubts that’s the root cause of America’s problem with mass shootings. KTOO reporter Andrew Kitchenman contributed to this story from Juneau.